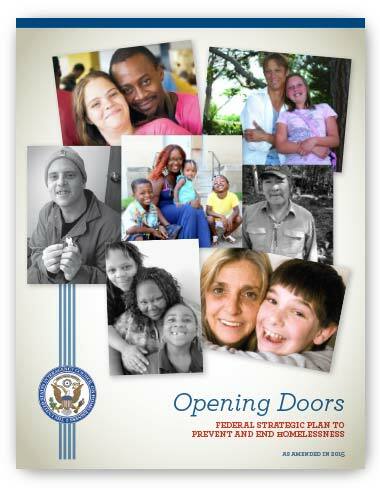 On behalf of the entire team at USICH, the teams at our Federal member agencies, and our many dedicated state and local partners working tirelessly to prevent and end homelessness, I am thrilled to share with you this updated version of Opening Doors, as amended in 2015. This document is the culmination of a tremendous amount of work by countless individuals who contributed ideas and information through online forums, in meetings, and by analyzing their agencies’ programs and policies, helping to identify best practices and lessons learned from their years of experience. That collective wisdom has shaped and strengthened this amendment and its focus on objectives and strategies informed by data, research, and results. The release of this amendment could not be more timely. We have made great strides toward the goals established in Opening Doors, but there remains a large amount of work to be done. Today, on the anniversary of the original publication, we reaffirm our commitment to achieving an end to homelessness in America, with even greater confidence in our collective ability to solve this problem. Together, we are proving that homelessness does not have to appear in the pages of American history as a permanent fixture, but as a problem the American people overcame. It is my hope that the release of this amendment to Opening Doors will help move us closer to the lasting solutions that we can and must implement.